The P3200 models are available in single or dual piston formats for increased operating ranges. Units can be supplied in psi, bar, kgf/cm², and MPa. 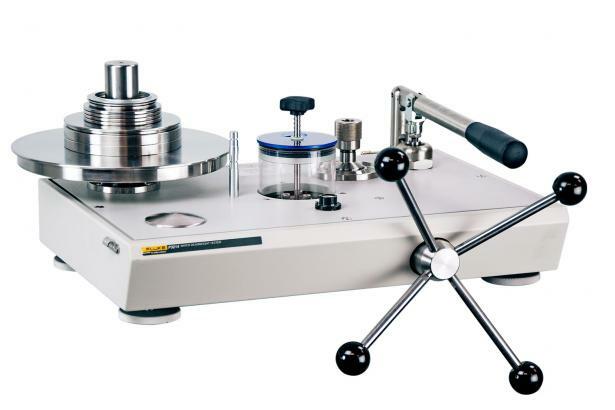 This robust instrument is highly accurate, quick and easy to use. Units feature a built-in priming pump for large volume applications, piston flotation indicators and a high quality screw press for fine pressure control. Fluids Instruments can be supplied for use with Skydrol or brake fluids. Due to the aggressive nature of these fluids the standard nitrile seals and the acrylic reservoir tube will be replaced by either Viton or EPDM seals (as applicable) and an aluminum reservoir tube. For these or any other specialty fluid applications, please consult the factory. 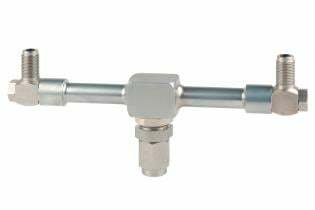 This adapter mounts directly to the test port of the calibrator and allows for the calibration of two instruments at the same time or the connection of a reference test instrument.